Search Google Scholar. Use the Advanced Search option by clicking on the dropdown menu of the search box to make sure you get only the results you want. Explanation of Google Scholar's advanced search. If you don't want patents, be sure to exclude them as they are automatically included. Configure Google Scholar to link you directly to MU resources. 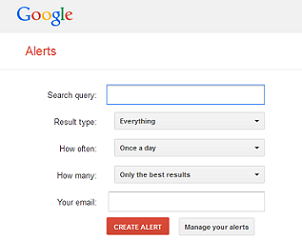 After searching, click the "Create alert" button on the left side of the page to set up email alerts. You do not need a Gmail address to use this. Receive alerts from Google Scholar when an article is cited. Search through the Google Alerts search site. You will see a preview of what type of results you will receive. You can choose the frequency and volume of the alerts as well as choose between email and RSS alerts. Search Google News, then scroll to the bottom of the page to create an email alert or to subscribe to the RSS feed. Google News also has some premade RSS feeds. Or you can personalize your Google News page (news subjects, sources, etc.) and scroll to the bottom of the page to subscribe to your personalized RSS feed. The * is a fill-in-the-blank or placeholder for words. So this search will find "dog bites hurt," "dog bites man," dog bites case," etc. dogs -puppies If you put a minus sign in front of a word, Google will exclude any results with that word. This search will find everything about dogs, but ignore any results that are about puppies. dogs cats You don't need to use "and" with Google, so if this will automatically search for dogs and cats. dogs OR cats This will find anything that is about dogs and anything that is about cats. This is like combining a search for "dogs" with a search for "cats." "dogs are awesome" The quotation marks make Google search for that exact phrase. If a website was called, "dogs are so awesome," Google would ignore it. dogs site:nytimes.com This will search for mentions of dogs only from nytimes.com. It will only search this one website.